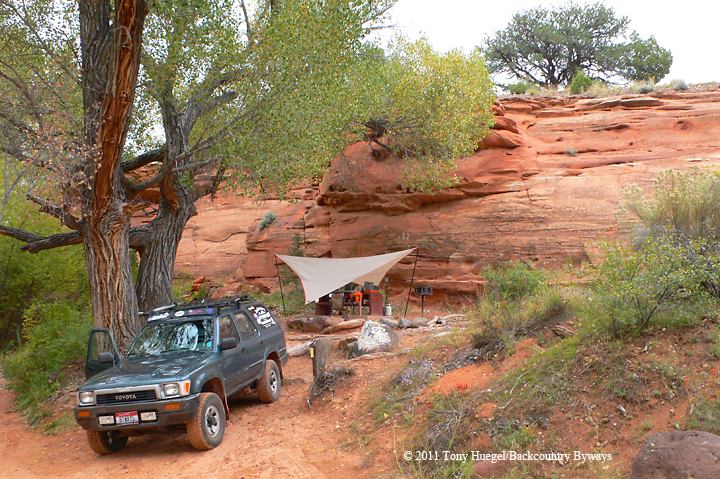 Backcountry Byways LLC: Utah's Escalante country seems overlooked by Moab-bound masses -- and we're glad! 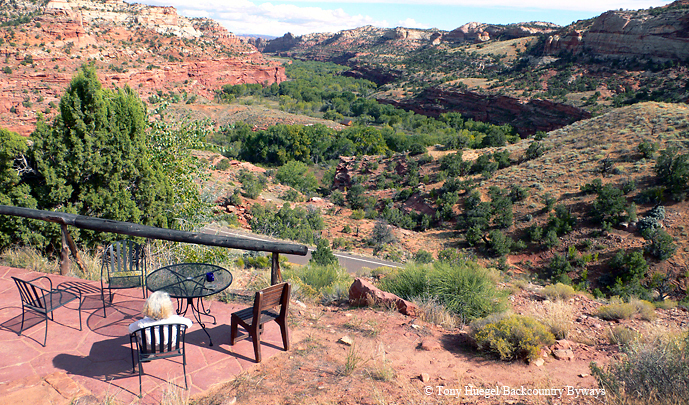 Utah's Escalante country seems overlooked by Moab-bound masses -- and we're glad! 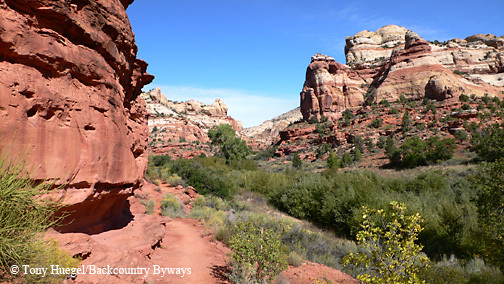 Note: To learn more about adventure driving in Grand Staircase-Escalante National Monument, as well as Capitol Reef National Park, pick up a copy of our guidebook, Utah Byways. This post includes videos and a Google map. Escalante, Utah -- We may not be done with touristy Moab, but more and more we are drawn to Utah's remote, often overlooked (and underappreciated) portals to canyon country -- humble hamlets like Green River, Hanksville, Boulder and Escalante. That's how Escalante, a village of some 800 souls, seemed when we spent a long early-October weekend in this isolated land of sinuous sandstone canyons, flash floods and piney woodlands atop a high plateau. Escalante is notable as the gateway to the magical canyons of the Escalante River and its tributaries, where a certain genre of backpackers spend days and hike for miles between sheer, and somehow sensuous, walls of salmon-hued rock. 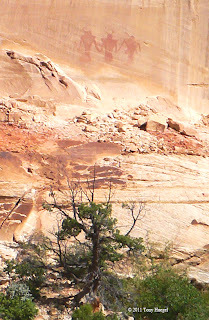 There are, too, the region's undeveloped national park (Capitol Reef), and its primitive national monument (Grand Staircase-Escalante, a legacy of Bill Clinton's waning hours as president). When we arrived, snow had frosted the terraces of the high plateaus and sandstone bluffs. Rain had left the banks of the river and its tributaries streams, as well as the region's dirt roads, soft, even perilously muddy in places. Fortunately, though, one doesn't need to go far from Escalante town, or even work up a walker's sweat, to witness the artistry that time and erosion have patiently worn into the rock. I'd hoped to drive Hole-in-the-Rock Road, named for a harrowing crack through which Mormon pioneers lowered their wagons, to a trailhead or two leading to the river canyon. But the helpful and knowledgeable folks at the new multi-agency visitor center advised me that mud had made the road impassable. 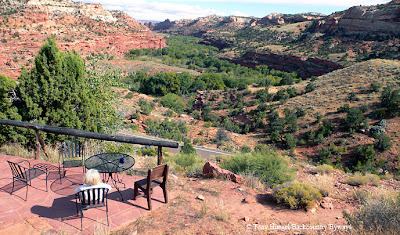 One advantage of this place, however, is that similar experiences can be had just off SR 12 east of Escalante, on two popular canyon hikes to waterfalls on perennial Calf Creek. 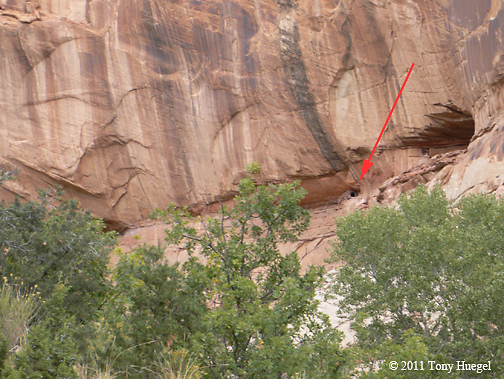 The first hike, to Lower Calf Creek Falls, is especially popular. Even in October, we met a number of fellow hikers--including some from Europe--although it certainly wasn't crowded. 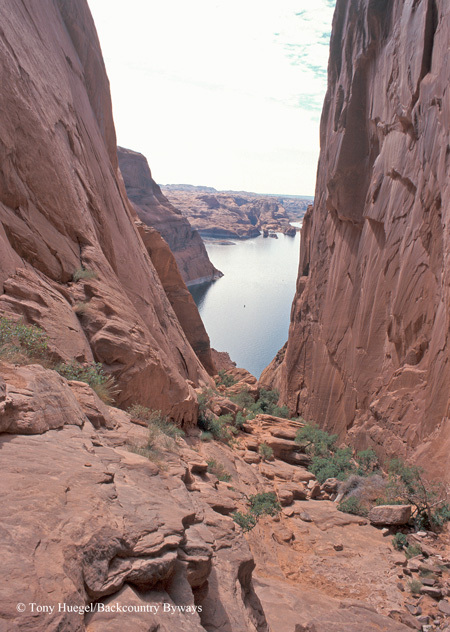 The easy 6-mile (round-trip) trail to Lower Calf Creek Falls begins at the campground at the U.S. Bureau of Land Management's Calf Creek Recreation area, about 15 miles east of Escalante. For day users, there is a $2 fee. 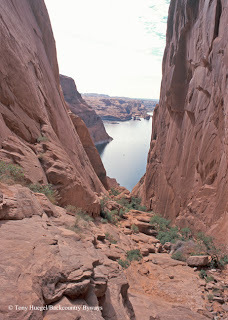 The hike, preferably taken in cool weather as opposed to summer's triple-digit temperatures, was endlessly rewarding. For being so convenient and short, we found filled with sites and surprises, all of it remarkably satisfying for the minimal investment in time and effort it required. Interpretive stops, and a self-guiding brochure, make it easy to spot and enjoy the canyons natural and prehistoric riches. The massive, rounded sandstone cliffs and bluffs towered above the well-vegetated streamside environment, which, oddly, was farmed in the early 1900s. Spectacular and, as always, deeply mysterious anthropomorphic figures -- Fremont-style pictographs -- gazed out across the canyon from a sheer wall on the opposite side of the canyon from where the heavily-trod hiking trail is located. Then we spotted, high in an alcove of a cliff, a small stone structure, probably a granary left by ancient Fremont-culture people who once occupied the Colorado Plateau. We saw a river otter in the stream, where the once-scarce animals are making a comeback. Unfortunately, she also spotted a harmless little snake skittering across the trail. At one point, we could look down and watch upstream-facing fish (I'll guess trout, but I know little of such things) seeming to play in the creek's clear waters. 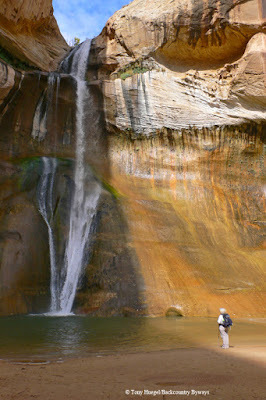 The hikes crown jewel awaits at trail's end, where the cooling veil of Lower Calf Creek Falls waters an idyllic oasis. Our second hike was a bit more difficult to locate, since the turnoff from SR 12 isn't signed. It's about midway between mileposts 81 and 82, on the west side amid pinyon pines and junipers. This trail leads to Upper Calf Creek Falls. This time, however, we followed cairns -- rock piles that mark the trail -- across a couple of miles of high, exposed sandstone. Instead of following the floor of a canyon, looking up at the cliffs, we hiked toward the rim of the canyon, and looked out across the region's deeply incised sandstone expanse. The hike brought us to yet another magical setting. Here the stream flowed across the rock to spill over a smooth sandstone ledge, raining down onto another oasis (access by a fork in the trail, if one wishes) far below. 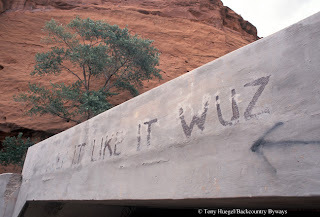 With the Escalante River trailheads apparently inaccessible due to mud, even in my 4Runner, we headed to the hamlet of Boulder, and followed Burr Trail Road (paved) between the soaring walls of Long Canyon. We pulled into the lovely little campground at Deer Creek Recreation Site (bring water), set up camp, then continued to Wolverine Loop Road. opposed paving Burr Trail Road. 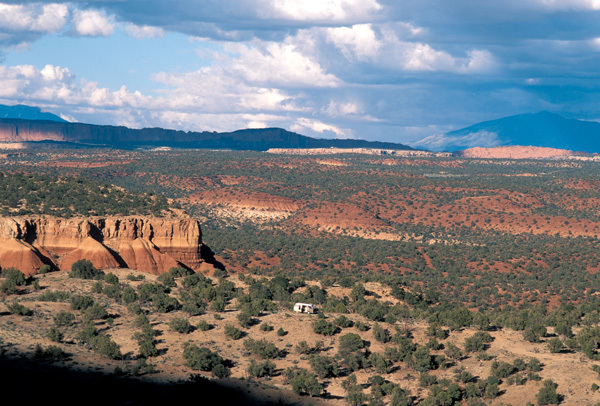 It had been years since I'd been on that enchanting dirt road, which winds amid pinyon-juniper woodlands to cross wide washes (damp from recent rains) at the base of massive red cliffs. I'd longed to take my wife there, for the effort it takes to get there makes it all the more rewarding. Since the skies were unsettled and rain seemed likely, my wife and I shared some unease about trekking alone out there, where roads become impassable when wet and washes turn into raging torrents in storms. But I judged it worth the risk. 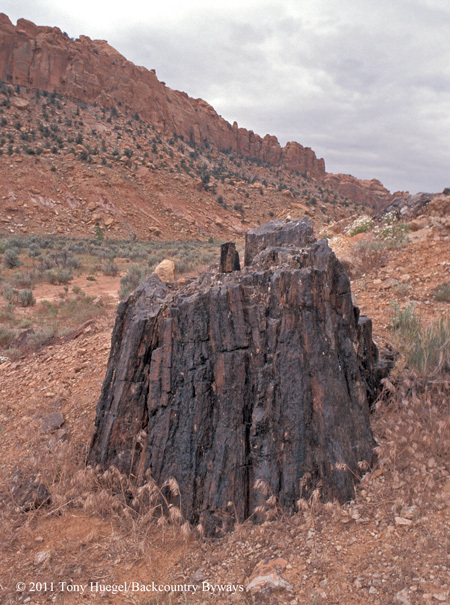 After crossing wide washes and wending along narrow ravines, we arrived at the Wolverine Petrified Wood Area. From the parking area we hiked along a streambed, following a faint trail that led to a concentration of primordial stumps and logs, some of them huge. Remnants of lush forests that existed and were buried in dinosaur times, today they are rock, their wood long ago replaced by minerals. We were glad to make our way back to paved Burr Trail Road and the campsite, since a light rain began just as we did so. It wasn't much, certainly not enough to dampen the pleasure of making a campfire and watching the setting autumn sun bathe the creamy Navajo standstone in a firey glow.